Get the WoT hardware kit + book from Pi Supply (Worldwide)! Get the WoT hardware kit + book from Sparkfun (US)! Get the book from Manning.com! Get the book from Amazon.com! Get the book from Amazon UK! The Internet of Things (IoT) is a hot conversation topic. Analysts call it a disruptive technology. Competing standards and technologies are appearing daily, and there are no tangible signs of a single protocol that will enable all devices, services, and applications to talk to each other seamlessly. Fortunately, there’s a great universal IoT application platform available now: the World Wide Web. Existing Web standards and tools provide the ideal substrate for connected devices and applications to exchange data, and this vision is called the Web of Things. 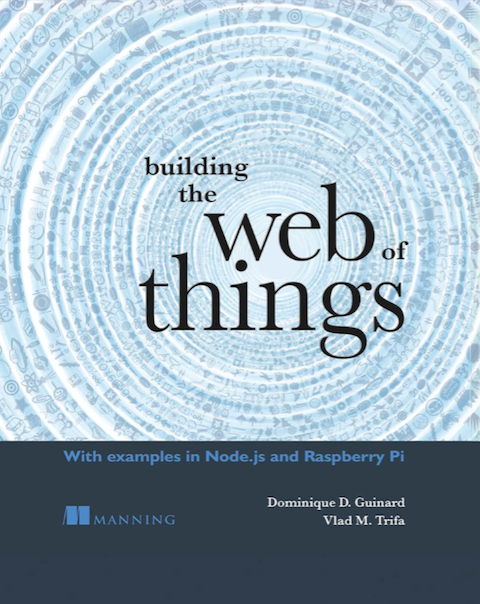 Building the Web of Things is a hands-on guide that teaches how to design and implement scalable, flexible, and industry-ready IoT solutions on the Web. This practical book will show you how to connect various devices to the Web and how to expose their services and data over REST APIs. After you build a simple proof of concept app, you’ll learn a systematic methodology and architecture for connecting things to the Web, finding other things, sharing data, and composing these components to build large-scale distributed applications. Each chapter will teach you in detail the how to take advantage of a new generation of real-time, web-connected devices and services and create the scalable applications that merge the physical and digital worlds. Whether you’re a seasoned developer, a system architect, or a curious amateur with basic programming skills, this book will provide you with a complete toolbox to become an active participant in the Web of Things revolution. Whether you’re a seasoned developer, a system architect, or an amateur with basic programming skills, this book will provide you with a complete toolbox to become an active participant in the Web of Things revolution. Dominique “Dom” Guinard and Vlad Trifa are the co-founders of EVRYTHNG, a large-scale Web of Things cloud and webofthings.org, the earliest community for practitioners and researchers in the Web-connected devices. Dom got his Ph.D. from ETH Zurich, where he worked on the early concepts of the Web of Things architecture: an open application layer for the Internet of Things. Vlad completed his PhD at the Institute for Pervasive Computing at ETH Zurich working on the Web of Things and real-time data sharing, collection, and processing using Web technologies. Both are veterans of WoT and IoT technologies and have pioneered this field at SAP and MIT.